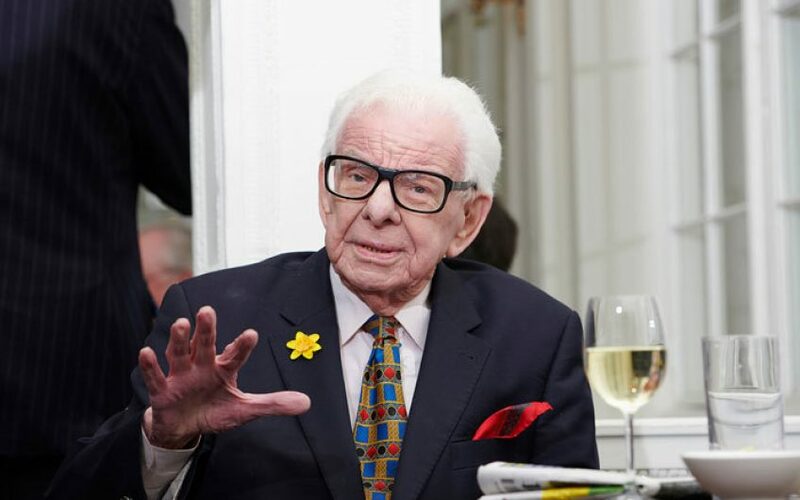 Having missed two lunches, due to what Oldie editor Harry Mount called an ‘unexpected appointment with a pavement’, the great Barry Cryer returned. He gave a faultless rendition of the Holy of Holies – the parrot joke – and introduced each of our speakers – John Motson, William Keegan and Lady Colin Campbell – with a characteristically witty rhyme. John Motson spoke first. He entertained us with tales from his career: the commercialisation of the beautiful game, his run-ins with the greatest players and managers of the day. One delightful anecdote followed another. He described how he first worked for the now defunct weekly local paper the Barnet Press, before moving on to radio and television. He mentioned the odd gaffe, like when he first started on television, saying, ‘For those of you watching in black and white, Spurs are in the yellow shirts’, or when at a World Cup he once said, ‘These Brazilians are so good, they are just running round the pitch playing with themselves’. Other features of his talk were the run-ins with sporting greats – like Bill Shankly, Brian Clough and Muhammad Ali – and his one-off appearance at the Olympics where he commentated on Greco-Roman wrestling for six consecutive mornings, only for none of the footage to be used. His book, World Cup Motty: My World Cup Stories, recounts the tales of Motty’s many World Cups: some he watched; he commentated on more. William Keegan, the former Economics Editor of the Observer, followed Motty. 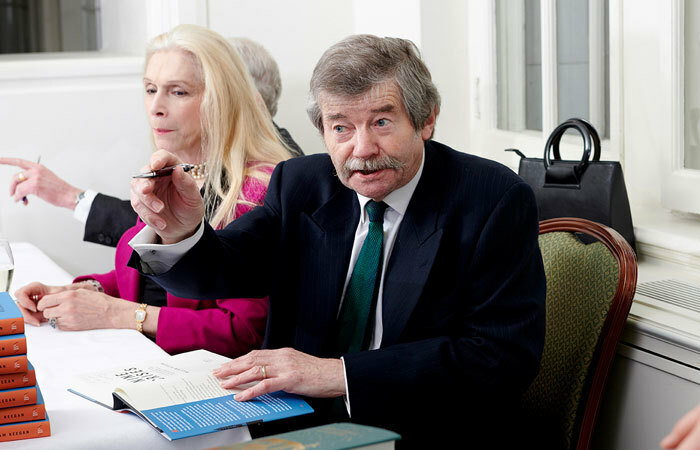 He presented his cheerfully-titled book, Nine Crises: Fifty Years of Covering the British Economy from Devaluation to Brexit. He also outlined some of the nine crises promised by the title. 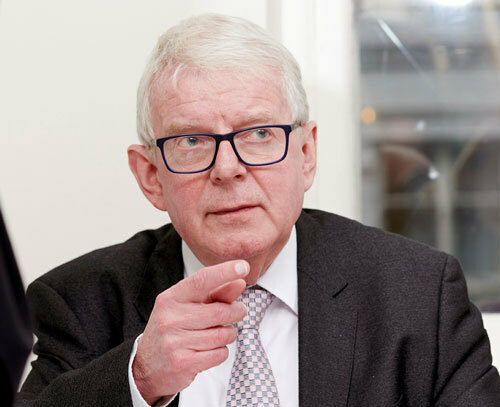 He did not have time to go into the Brexit crisis, though I am sure we will learn all about it – true or not – in the coming months! 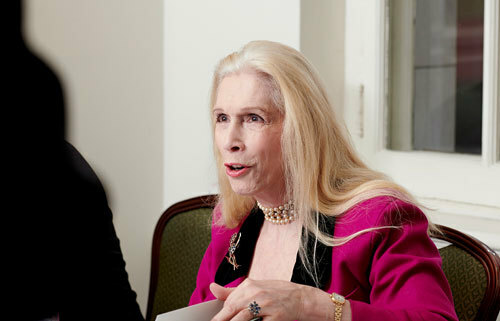 Then Lady Colin Campbell spoke. Her new book The Queen’s Marriage gives an almost first-hand account of Her Maj’s marriage to Prince Philip. Lady Colin’s sources were impeccable, including many of the royal couple’s nearest and dearest. Lady Colin concluded that the Queen, though brilliant, is an ordinary woman; Excellently trained by her grandmother in the workings of the crown, but ordinary. Philip, on the other hand, was extraordinary. He was something of an enigma to the British establishment. He was from a highly educated background – his aunt Princess Marie Bonaparte being a leading light among psychoanalysts – he hadn’t a penny to his name and was so outstandingly masculine that the establishment didn’t think he could keep his flies up. The only man more masculine than Prince Philip, Lady Colin said, was Sean Connery. Another enormous thanks to the hard-working staff at Simpson’s and the invaluable support of our sponsors Noble Caledonia without whom we could not put on such splendid lunches.